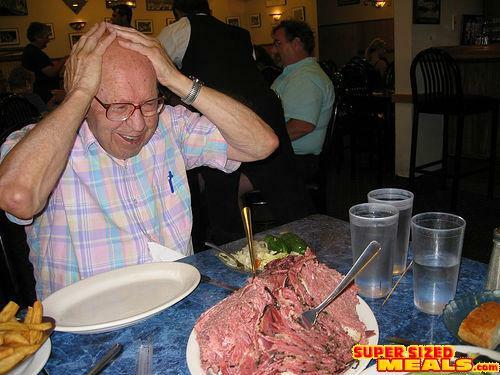 Grandpa Al is fast becoming a bit of a celebrity here on SupersizedMeals.com. 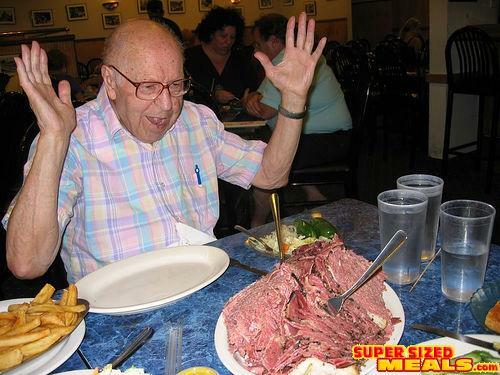 This time he tackles Harold's New York Deli's Pastrami Sandwich. It's a HUGE sandwich! Harold's is a large restaurant serving enormous portions of food to enormous people (and regular size people, too). It is for this reason, we believe, that Harold's sometimes doesn't get the respect it so well deserves. It would be natural to assume that a restaurant whose schtick is to serve comically large servings of food would not devote much attention to the quality of that food. That assumption, at Harold's, couldnâ€™t be more wrong. At its best, Harold's pastrami is as good as it gets. This is half a large sandwich. The other half is hidden behind it. Located in a Holiday Inn in an unattractive collection of office parks and hotels, Harold's is modeled on the classic New York Jewish deli (old Carnegie Deli model). In fact, many uniquely Carnegie menu items, such as Go, Giants, Go! (two foot long dogs with a giant knish), also appear on Harold's menu. There is often a wait for tables - Harold's is extremely popular. 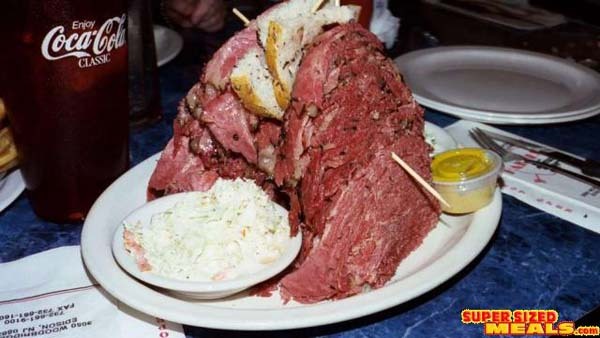 This "small" corned beef was ordered lean and, sure enough, it had barely any fat at all. The dual stars of the menu are pastrami and corned beef. Waiters no longer ask if you'd prefer lean or "juicy" - juicy (with fat) is assumed unless you specify otherwise. We've had it both lean and regular and, while the lean meats are moist and excellent, the regular versions can be extraordinary. 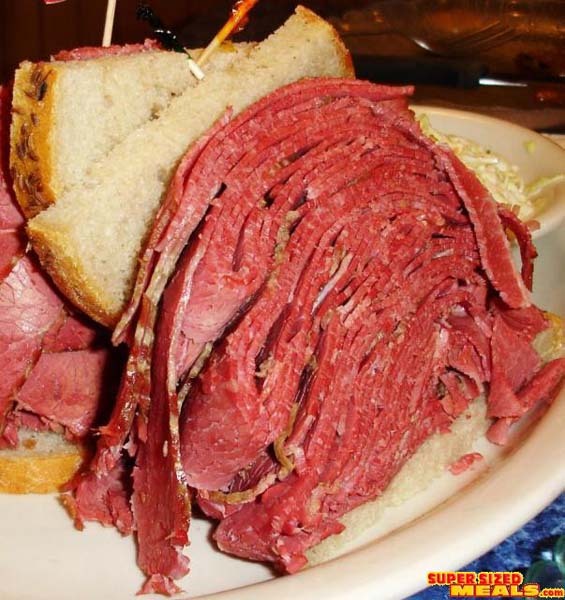 The pastrami, in particular, has a hauntingly smoky flavor and a steamy melting texture. Not for fat-phobes. One note of warning: it helps to specify something along the lines of "not lean, but not too much fat", for on occasion your juicy order can arrive simply too fatty to enjoy fully. 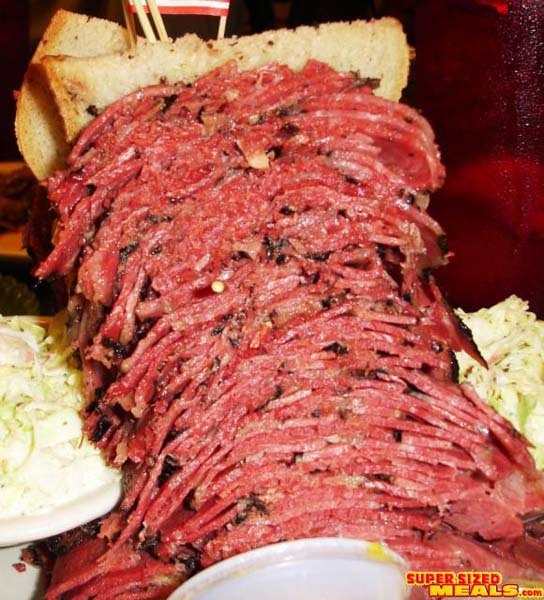 Nonetheless, we feel the risk is worth what, at its best, is the finest pastrami sandwich around (and we've been to Katz's and enjoyed their hand-carved meat). 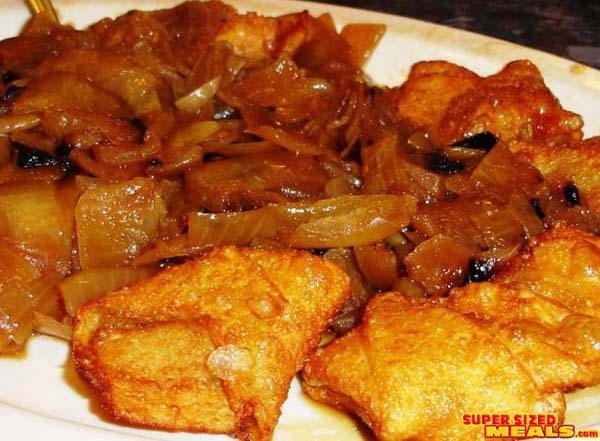 Fried kreplach come with ultrasweet, long-cooked onions. Your sandwich gives you access to what is billed as the world's largest pickle bar. Half-sours, full-sours, dills, sliced, spears, tomatoes, kraut, and fantastic health (or Claremont) salad (cabbage, carrots, peppers in a vinaigrette) are available, as are stacks of their good chewy crusted rye bread and small onion biscuits. Sandwiches also come with spectacularly good sweet slaw. Here's what you came for! The cheesecake recipe keeps changing. We would once claim that Harold's served the best cheesecake in the land. Today's version is good, if not the worldâ€™s best, lightly sweetened and tasting mostly of cream and cheese and eggs, with no lemon or vanilla flavoring that we could detect. It sits on a thick, but not sweet, graham cracker crust. The eclair goes beyond comically large into preposterous territory. We did not fall in love with this item. Your slice of layer cake will serve a table of six generously. A container of crunchy rugelach, speaking more of fruit and nuts and sugar than cream cheese, would be a nice sweet for when you get home. There are a few Harold's delis in NJ, but we think this is the only one actually owned and run by Harold Jaffe. You can usually spot him in the restaurant. Prices are very high, but much of the food is sized to be shared. In fact, the menu recommends it.